In the Marcellus and Utica oil and gas fields, production has grown rapidly over the past several years, and infrastructure growth has not kept pace. This is partly because pipeline projects are costly and may take several years to bring online. As a result, there is a large backlog of wells that have been drilled but won't produce until there is available infrastructure or until the price of natural gas increases. 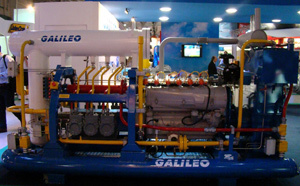 Our Galileo wellhead compressor and Virtual Pipeline system reduces the investment necessary to perform the gas gathering on geographically dispersed wells and gives the producer the possibility to sell gas directly to the consumer, skipping all intermediaries in the value chain. We designed a full range of systems for a variety upstream applications such as wellhead, gathering, re-injection, fuel booster, transportation. 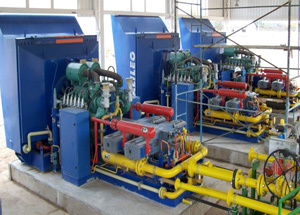 At wellhead applications, the conditioning of the gas for the compression stage is a critical stage of the process. 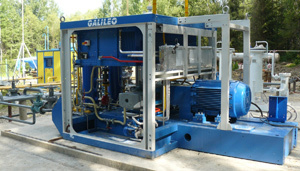 The Galileo Wellhead units have a system of horizontal separation with automatic drain that separates solids from liquids before entering the compression system. All the process is fully automated and can be remotely control via Galileo SCADA. The Virtual Pipeline coupled with the Galileo wellhead compressors is an efficient solution to the geographical dispersion of wells and makes the traditional gas gathering economically viable. 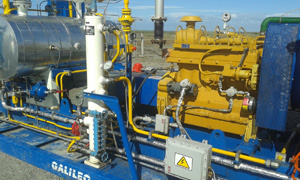 Our compressors are specially designed for the Oil & Gas industry. They comply with the strict guidelines of API standards. We have over 40 million hours of compression experience. Our design is modular, flexible and easy to operate. All our compressors are Plug & Play and can be easily repositioned. Suction pressures as low as 0.2 PSIG and discharge pressures up to 4500 PSIG. Flow rates from 0.1 and up to 55 MMSCFD.